TOMS RIVER, N.J. (WPVI) -- Police have arrested a suspect in connection to a robbery at a Toms River bank. 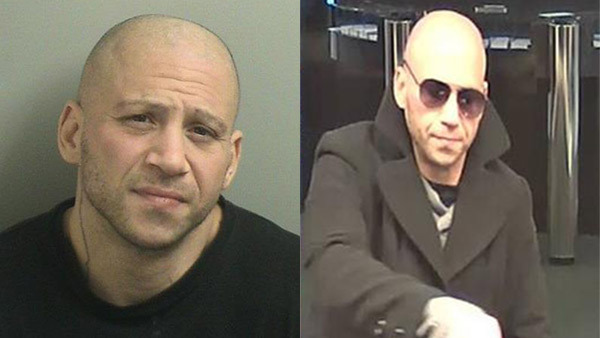 39-year-old Angelo Grenci of Berkley Township, New Jersey was arrested Tuesday morning at the Friendly's restaurant on Route 37 West. The robbery occurred around 4:40 p.m. Monday at the TD Bank located at 10 Mule Road. Police say Grenci entered the bank wearing a black pea coat and sunglasses. He filled out a bank slip at the reception counter and then presented it to the teller. Police say he received an undetermined amount of cash and then fled the scene on foot. Police say within hours of posting surveillance images, tips starting pouring in and a positive ID was made. A tipster told police Grenci would be at the Friendly's restaurant at 9:00 a.m. Arriving officers located Grenci seated alone in a booth. They say he was in possession of a large knife and attempted to use a false identity. Grenci is being held on $110,000 bail for the bank robbery. Additional charges have been filed for possession of a weapon and the use of the false name.